To understand the evolution of flowers and mating systems in animal-pollinated plants, we have to directly address the function for which flowers evolved--the movement of pollen from anthers to stigmas. However, despite a long history of making significant advances in our understanding natural selection and evolution, the field of pollination biology has largely studied pollen movement indirectly (e.g., pollen analogues or paternity assignment to seeds) due to a lack of suitable pollen tracking methods. Here, we develop and test a novel pollen-tracking technique using quantum dots as pollen-grain labels. Quantum dots are semiconductor nanocrystals so small in size that they behave like artificial atoms. When exposed to UV light, they emit extremely bright light in a range of different colours. Their photostability, broad excitation range, and customisable binding-ligands make quantum dots ideal bio-labels. We tested the suitability of CuInSexS2-x/ZnS (core/shell) quantum dots with oleic acid (zinc-oleate complex) ligands as pollen-grain labels. We found that quantum dots attach to pollen grains of four different species even after agitation in a polar solvent, suggesting that the oleic acid ligands on quantum dots bind to pollenkitt surrounding pollen grains. We also showed that most pollen grains within anthers of the same four species are labelled with quantum dots after applying sufficient quantum-dot solution to anthers. To test whether quantum-dot pollen-labels influenced pollen transport, we conducted pollen transfer trials on Sparaxis villosa (Iridaceae) using captively reared honeybees. We found no difference in pollen transport between labelled and unlabelled pollen grains. 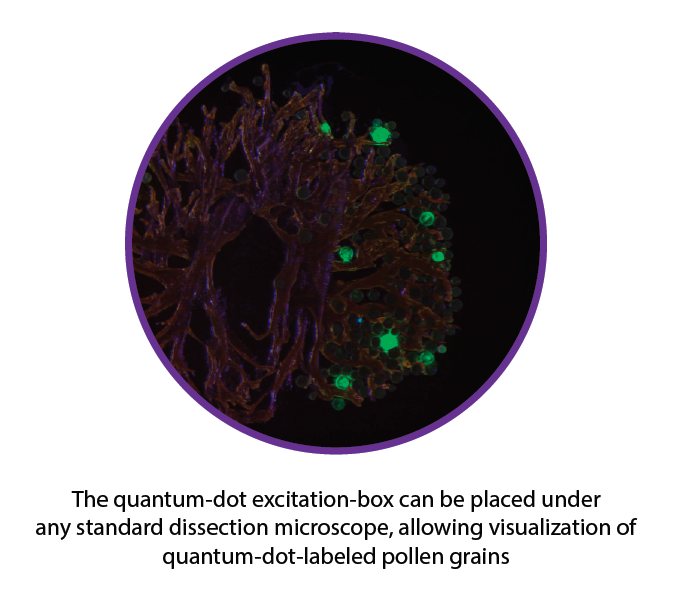 Our experiments therefore demonstrate the potential for quantum dots to be used as easily applied pollen labels, which allow subsequent tracking of the fates of pollen grains in the field. The ability to track pollen grain movement in situ, may finally allow us to address an historically neglected aspect of plant reproductive ecology and evolution. Find the full article here.